​Who does not want to be the “Tiger Wood” in the golf course? At least I want to be. But despite my wish and attempts, sometimes I miss my shots just for few yards. If you do not want to miss a shot, you must get one of the best golf rangefinder from our selections. 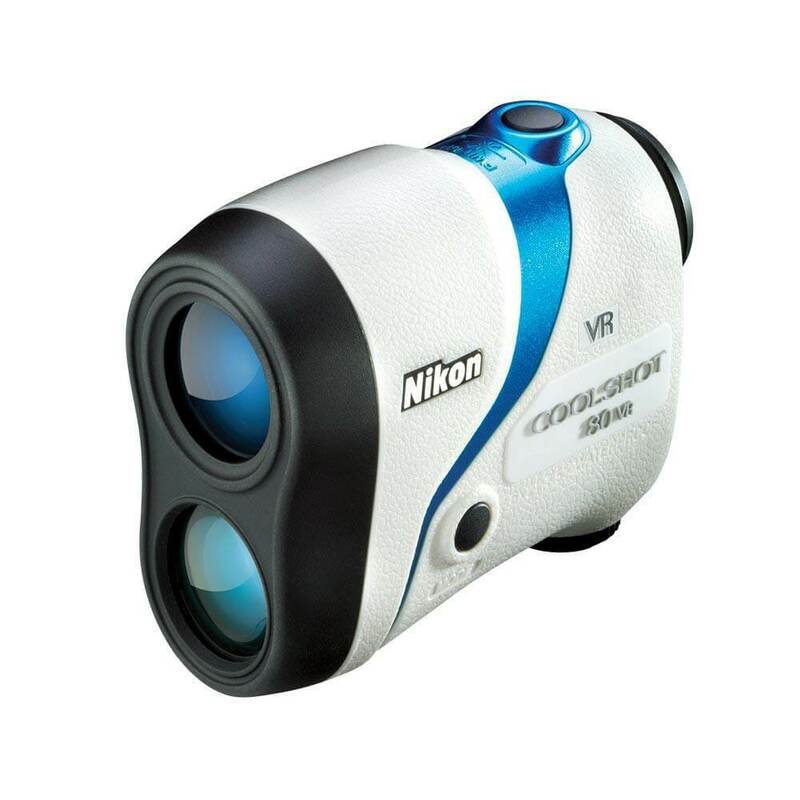 You have a large number of options for golf rangefinders. It is good no doubt. But it can be misleading sometimes. Especially if you do not have that much time to review a long list. We have done some extensive research on the golf rangefinders. Our concentration was on three issues 1. Price, 2.Performance, and 3. Features. Based on our meticulous screening we have come up with the following ten golf rangefinders for you. First focusing system,Fully multi-coated optics,USGA tournament legal. What is slope vs no-slope and tournament legal? What is the best rangefinder for you? This is the best rangefinder in the market. It comes with the latest Stabilized technology. This will keep your rangefinder steady even in the slight movements of your hands. You do not have to worry about the up and downhills of the course. Nikon’s ID incline decline technology will provide you slope adjusted distance. You can turn it off to make it a USGA compatible device. You will get your measurement results in 0.3 seconds from Nikon Coolshot Pro Stabilized. All the credit goes to the next-gen Hyper Read technology. This is the fastest rate in all rangefinders. This device is known for its accuracy. It will give ± 0.75-yard accuracy within 700-yards. You will get ± 1.25-yard accuracy beyond 700-yards. You can use the device in a diverse temperature. It will work fine between 14°F to 122°F. This device will give you a complete view of the course with its 8-seconds continuous measurement system. Each time you lock on a target a green circle will appear on the viewfinder. This water and fog proof second-generation rangefinder have monocular optics. You will get high and wide visibility with the OLED display. This high-end device comes with a 5-year warranty. This top-ranked rangefinder has all the features to win your best per. It will give you a short vibrating pulse when the laser locks at the flag. Thanks to the PinSeeker with JOLT technology. You will get slope compensated distance from this champion rangefinder. It will calculate and adjust the distance based on elevation. Bushnell Tour V4 Shift Patriot Pack also comes with this slope adjusted feature. This slope compensation can be turned off using slope switch technology. It will make your Pro X2 rangefinder USGA tournament legal. Moreover, you can get the same feature in the V4 Shift Patriot Pack. Is there any variation in the light condition? You can toggle between bright red and sharp black display according to the light condition. This dual display technology is only available in Pro X2. The measuring range varies from 5 to 1300-yards. You will get ± 0.5-yard accuracy. This fully waterproof device comes with 6x magnifications. Fast focus technology will give you an instant reading with a stable grip. Fully multi-coated optics will ensure a clear view. 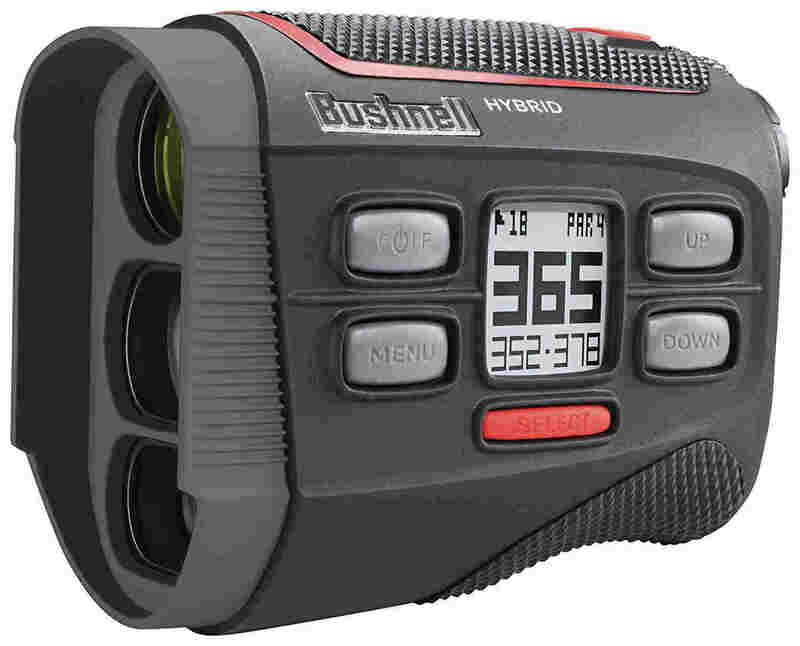 Bushnell Hybrid is the world’s first laser rangefinder and GPS combo. You will get an integrated display showing the target position and measurements. This golf range finder comes with 36000+ maps of 30 countries. So you will know everything about a golf course before the game started. Like its Pro X2 counterpart, this device comes with JOLT vibration and PinSeeker technology. Moreover, it has Fast Focus and 1-yard accuracy. It has a 5x magnification. You can charge the GPS with USB charger. However, CR2 battery power up the laser part. The device has Bluetooth connectivity for Auto Course Update. This integrated device can measure up to 4 hazard distance for every hole. This rangefinder has a dedicated app. You can download and use it during the game. Moreover, the app will store all your measurement data. So you can always look back at your shots. Be careful about the exterior GPS readout. All your measurement info will be there. Your competitors can see your aim! 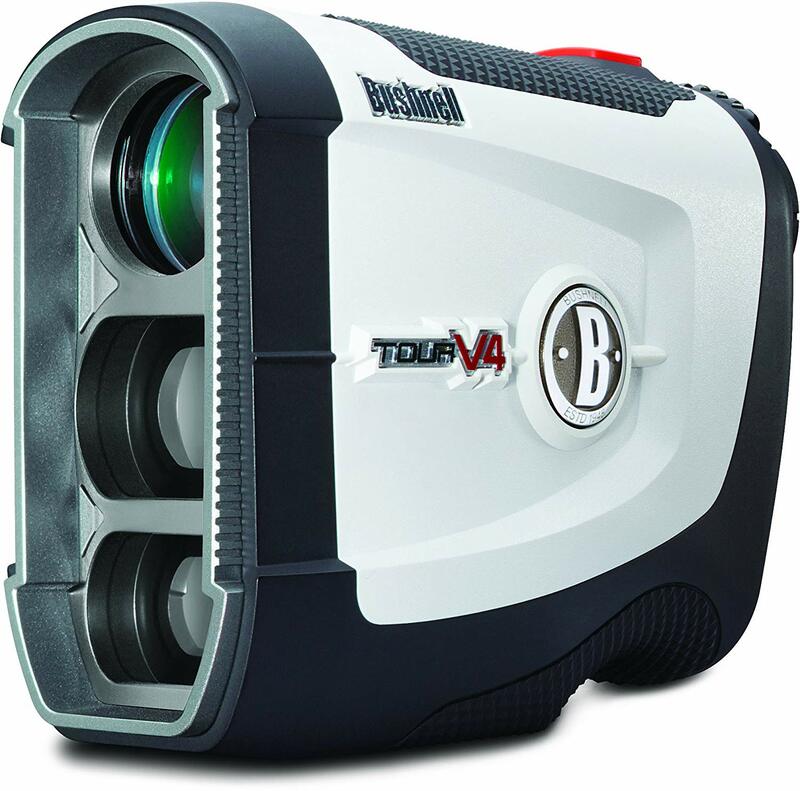 The tour v4 will give all the stunning features of Bushnell golf rangefinder at an affordable price. This water-resistant device will ensure a stable grip during measurements. PinSeeker JOLT technology will provide the same Bushnell confidence in your every shot. You can be sure about your per because of its 1-yard accuracy within 1000-yards. You can precisely measure the flag up to 400-yards. The Bushnell Tour V4 has fast focus system with 5x magnifications. You can get a complete view in the LCD display. Fully multi-coated optics makes the image more crisp and clear. However, you have to be extra cautious during the rain. The device is not waterproof. This device comes with enough battery life to complete your tournaments. You will also get a 2-year warranty. It has no Slope function. So it is always USGA tournament legal. Despite the absence of slope function, customers ranked it as one of the golf rangefinders because of its affordable price. The V4 Shift Patriot Pack comes with slope function. You can easily switch between slope and no-slope mode. The shift switch will let you do so. This Shift Patriot Pack model has all other features of Tour V4. But the price range is a little higher than the V4 model. Nikon Coolshot 80VR comes with the Optical Vibration Reduction technology. It keeps your rangefinder steady in every movement. 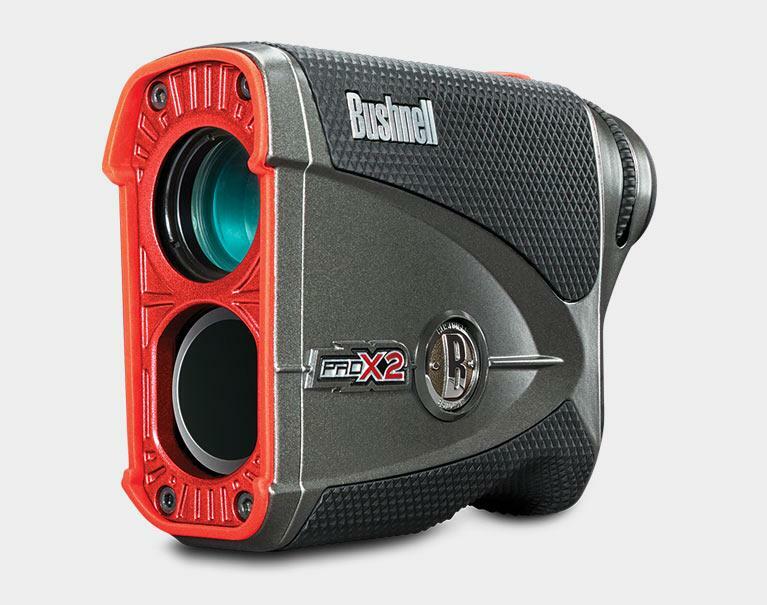 The laser rangefinder measures up to 1000-yards with 0.5-yard increment. It gives ±0.75-yard accuracy up to 700-yards. The accuracy is ±1.25-yard beyond 700-yards. Hyper Read Ranging technology ensure you get your readings in half seconds. This is quicker than most of the brands on the market. You will get a continuous view of 8-seconds. This helps to measure multiple objects in the field of view. It can detect hazards, pins, mounds, and trees in the field. The 6x monocular bright optics quickly find your targets. The long eye-relief is an excellent aid to aim your targets. The First Target priority mode selects the closest target in the view. So if the flagstick is in front of trees, this mode will aim at the flagstick first. LIke its Stabilized counterpart, Nikon 80VR comes with Locked On technology. A green locked on circle appear when a target when you point at it. You can get it at an affordable price tag. This rangefinder will not give you slope adjusted measurements. However, if you want it you can go for Nikon Coolshot 80i VR. This updated version has the ID incline decline technology. It will give you a slope adjusted the distance for a perfect green. Moreover, if you have a tight budget but still want the same Nikon standard you can check 40i. You will not get a limited range without the VR. But it has the same optical features as 80 VR and 80i VR. This green golf rangefinder will make all your shot noticeable in the course. This compact laser device has all the features to make you hot like a pro. We know the tension before a shot. It can make your hand a bit shaky. But this Precision Pro golf rangefinder will take care of it. Its Target Acquisition Technology will keep your focus steady no matter how much your hand jerk. If you need some extra confidence to lock get this green device. Each time you lock on it will give you a short burst of pulses. It means you are good to get the shot. Thanks to Pulse Vibration Technology. Are you worried about the hills or ditches in the course? Do not worry. You can rely on the Adaptive Slope Technology to get slope adjusted measurements. It will help you to choose the right Golf Club to overcome that distance. Precision Pro NX7 Pro may look like a small device. But it comes with a loaded customer care package. You will get 90-days money back guarantee. You will have a free supply of battery for your device for its lifetime. If you think you need more Precision, you always have the luxury of the trade-in. Did I mention it comes with a 2-years warranty? This rangefinder has a retro look. But it has all the state of the art technology to hit the hole. The Leupold Gx 5i comes with DNA digitally enhanced accuracy engine. You will get a faster measurement and pinpoint accuracy with this DNA engine and infrared laser. The accuracy can go up to 1/10 of a yard. This accuracy remains until 450-yards. The Leupold GX 5i works as your personal golfing assistant. It will give you ranging information and club recommendations. It uses your personal hitting strength, slope, and the environmental condition of the course. This device has the TGR true golf range mode to give you slope adjusted distance. Moreover, it will suggest a suitable club based on this distance. However, you can switch it off to make the rangefinder USGA tournament ready. You can use it even in bad weather. The fog mode will ensure a perfect reading in rain or in fog. You will always see a prism when you lock on your target. This model is lighter than all the GX series of Leupold. GX 4i3 and GX 3i3 are little heavier than this model. Both these models are cheaper than Leupold GX 5i3. However, only the GX 4i3 comes with slope adjustment. The model GX 3i3 has all the stunning features of Leupold expect the signature TGR. The manufacturer is so confident about the quality that it gives you a lifetime guarantee for Leupold GX 5i3. This is the ultimate competitor of Bushnell Hybrid rangefinder. 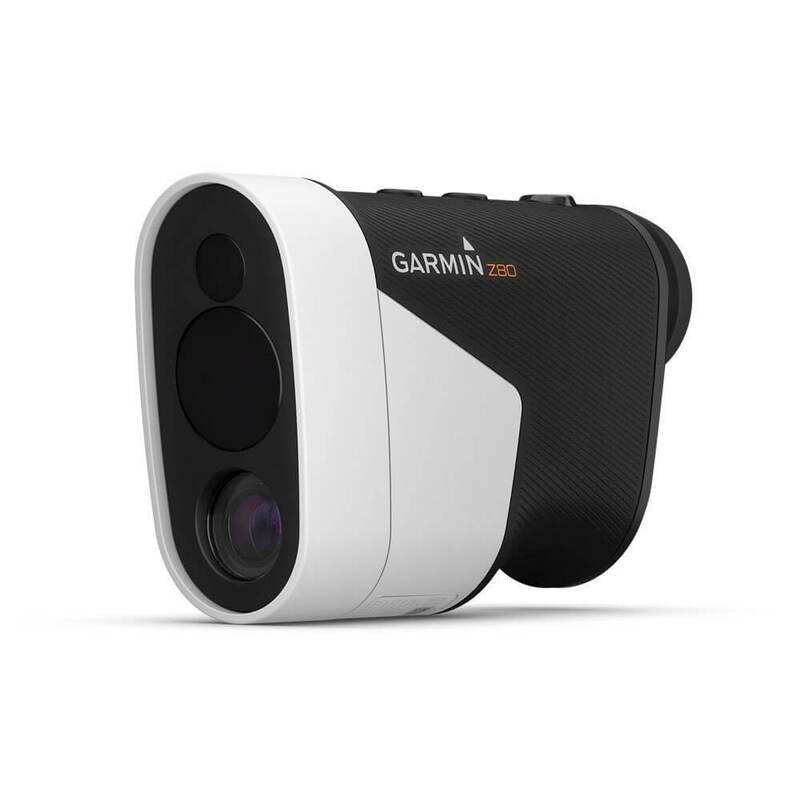 Garmin Approach Z80 is a golf rangefinder integrated with GPS. You will get a stunning CourseView and accurate measurement with it. The GPS has information of more than 41000 courses worldwide. It will give you an upper hand when you go to a new course. Your hand can always shake while you measure. But Garmin’s image stabilization technology will keep your focus steady. You can easily lock on the flag and get the distance from the green view. The green view overlay will give you both the flag and background distance. Now you do not have to measure them separately. It will also give you an amazing accuracy of 10 feet from the flag. You can play like a pro in any course with the PlaysLike Distance feature. It gives you the slope adjustment and club recommendations. However, if the tournament does not allow it you can turn it off. It has all the extraordinary features of the Leupold GX series. The Smart Key faceplate instantly turn the regular rangefinder into an accurate measuring device. In order to get the perfect results, you have to input the temperature and altitude of the course. It will also recommend the most suitable golf club based on ambient conditions. You will get a quick measurement with the DNA digitally enhanced accuracy. The PinHunter 2 laser technology enhance the function of the DNA engine. Each time you lock a target, the Prism Lock will boost your confidence with a prism in the viewfinder. The low glare, vivid OLED viewfinder will freeze to give you a complete display of the target. 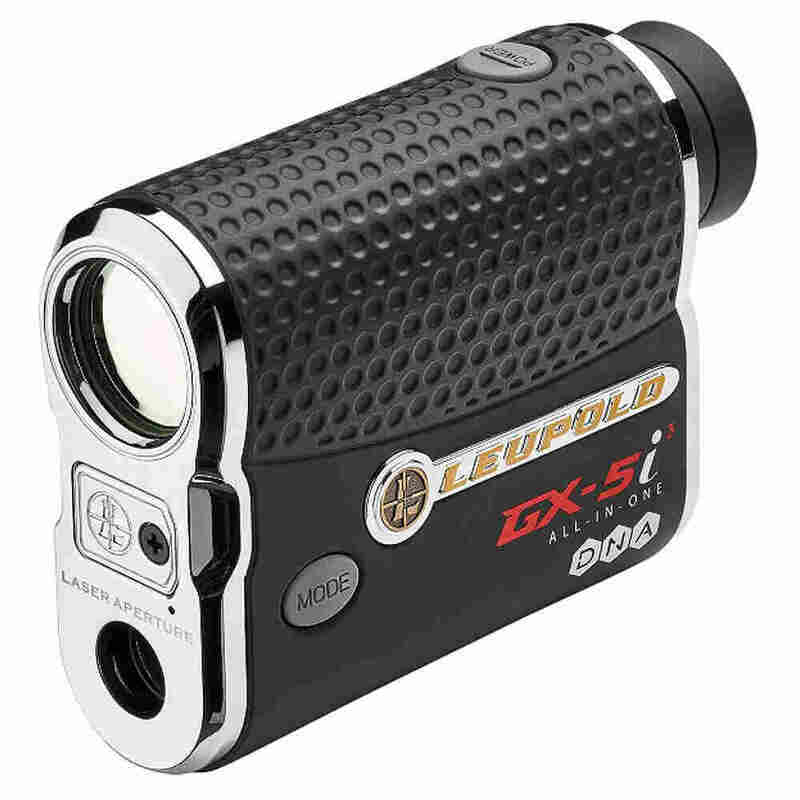 This basic model of Leupold GX series is a great option for novice golfers. However, the GX 4i2 is suitable for the mid-level golfer. Leupold GX 4i2 has DNA technology too. But it also has the PinHunter 2 technology. These two features ensure fast measurements and precise accuracy. You can insert the surrounding condition info to get the benefit of TGR. The TGR will also provide you with Club Selections for your shot.The GX 4i2 has a higher price tag than GX 4i. 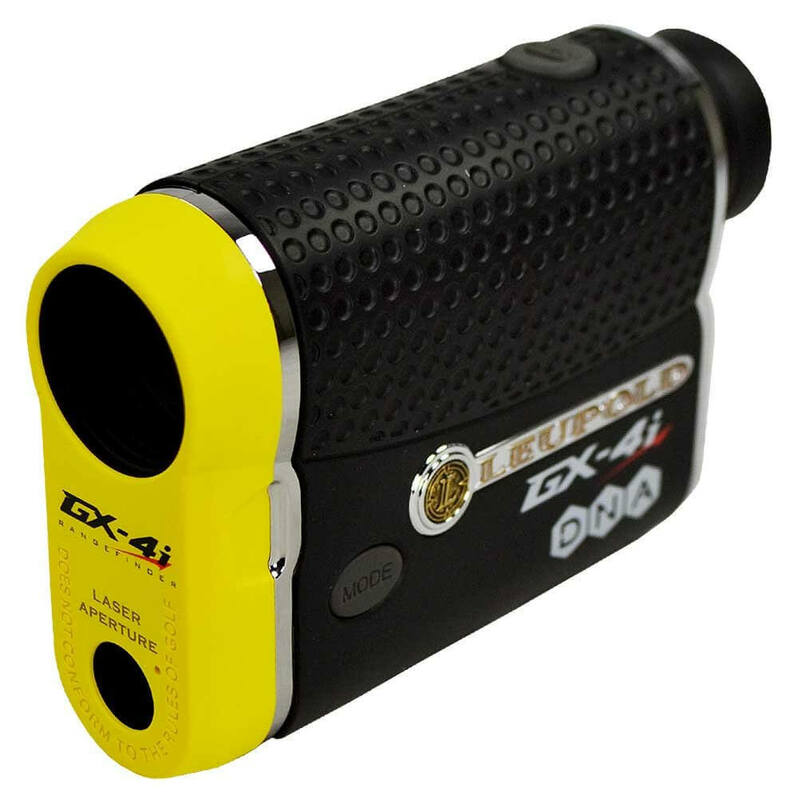 This is the most affordable one in our list of top ten golf rangefinder. You can have the quality and features of TecTecTec brand without hurting your wallet.PinSlope technology of this rangefinder will provide slope compensation for your yardage. You can be confident about the measurements no matter how much up or downhills you have in the course. Bad weather will not create any distraction in your per. The rainproof laser will measure the distance accurately. You will get ±1-yard accuracy up to 540 yard. You can get a holistic view of the course through the multi-layered lens of the viewfinder. You can use three modes for measurement. Pinseeker is for overlapping targets. First Priority mode is for the closest target on the farthest background. Lastly, the Scan mode is to measure everything in your view. This rainproof laser rangefinder comes with a 2-years warranty. So no matter what the weather is you must have this compact device in your golf bag. However, you can get the same quality for a cheaper price tag. VPRO 500 has all the great features of 500S except the slope compensated distance. However, the slope and non-slope issue probably remind you of the trigonometry class in high school. I am still scared of that teacher and do not want to recall it. The best thing is you do not have to do during your tournaments. Most of the golf rangefinder do the calculation for you. Let us look at how they do it. The golf courses have both ditches and hills. They are made such a way to test your measurement skills while you hit. The distance between the golf ball and the flag in a plane ground is the horizontal distance. But if the flag is on a hill or in a ditch, you have to consider that extra elevation or depression. Rangefinders with slope compensation technologies measure this vertical elevation using the trigonometric equation and adjust the horizontal distance. Golfers call this adjusted distance as slope compensated distance or just “slope”. If your rangefinder does not have this feature, I am afraid you have to recall your high school classes! Out of the ten golf rangefinder, five comes with slope adjusted measurement. They are Nikon Pro Stabilized, Bushnell PRO X2, Precision Pro NX7PRO, Leupold GX 5i3 , and TecTecTec VPro 500S. The rest has no slope adjustment technology. So they are tournament legal. The term “tournament legal” means whether you can use your rangefinder in a golf tournament or not. According to the USGA rule 14-3, you cannot use any DMD distance measuring device. The rule clearly says “during a stipulated round, the player shall not use any artificial device or unusual equipment”. The equipment may be for the purpose of gauging or measuring distance or conditions which might affect his play”. You cannot use those devices for handicapping purpose. If your device measures anything except range, it's not allowed to use in any game. So how you are going to use the golf rangefinder you picked from our list? USGA amended rule 14.3 in 2006 and added a special note. The committee can permit the use of DMD locally. However, this new law 13-3/0.5 prohibits the use of any DMD that can measure wind speed and slope. Moreover, you cannot use any rangefinder that recommends a club for a specific condition. So you have to turn off the Slope Adjusted distance mode in your rangefinder to make it tournament legal. Most of the high-end golf rangefinder has an indicator. It ensures that the match officials can check your device from the distance. Some device comes with the different colored faceplate (TecTecTec VPro 500s) for slope mode. Other devices (Nikon Coolshot Stabilized) have LED to indicate slope mode. The range is an important factor for choosing a rangefinder. Your choice will depend on the size of the course you play. You need a long rangefinder when you are playing in a big course. Most of the updated rangefinder models have a range higher than 1000 yards. However, basic rangefinders come with around 540 yard range. So you need to choose your range based on your preferences. But keep in mind that higher range sometime affects the accuracy. We all want a pinpoint accuracy. But range may compromise the accuracy. Most of the rangefinder will give ±0.5-yard accuracy within 450-yard. This accuracy will decrease with distance. After 1000 yard the accuracy falls within ±0.5-yard. So the accuracy will change with range. If you prefer to have a more accurate shot, you may have to compromise with range. A target locking mechanism provides extra confidence. Some golf rangefinder has a burst of pulses when you lock on a target. Some other models will give vibration to confirm a target lock. So you have to choose between these responses. You can get the burst of pulses if you are confident about your steady grip. Otherwise, a single vibration is great for you. This is the latest feature of the second-generation rangefinder. This technique helps you to aim precisely when your hand may move a little bit. This stabilization makes sure the focusing laser does not move from the target at any time. Most of the new rangefinder have this feature. Despite some veteran golfer are not supporting this feature, it is getting popular. Some of the hybrid rangefinders come with GPS. The GPS gives you a complete 2D picture of the entire course. These GPS has built-in data of minimum 31000 golf courses. The GPS enabled rangefinder will add an extra dimension in your shot and club selections. Moreover, you will have an idea about the different features of the golf course. If you want to have this extra advantage, you can get a hybrid rangefinder. However, professional golfers sometimes want to engage their skill. So they do not prefer this feature. Make sure you know whether your tournament allows the hybrid device or not. I know some of you have to bend your eyebrow on this. But as a high precision electronic device, high-quality customer service is required for a rangefinder. You need dedicated helpline for any issue. Moreover, the warranty duration is also very important. The longer warranty period will provide peace of mind. You may have a money back guarantee and trade-in facilities. Those are extra benefits from the manufacturer. Up and down hills may affect your shot in the course. You will need to adjust those up and downhill while measuring. You will need a slope adjustment feature in your rangefinder to compensate those. Most of the updated rangefinder models have this feature. They are mostly known as slope feature. But some golf tournament will not allow it in the game. If you use it, you may have to keep it noticeable. Before buying a rangefinder this will be the most important decision to make. A feature-packed rangefinder will be pricey. But it will come with some excellent features that will ensure perfect green. An expensive rangefinder may be a burden for a beginner, But A pro golfer will always prefer to have one in his gold bag. Price may vary among the models of same product series. If you know what features you really want, the price difference should not be a big issue. What Is The Best Rangefinder For Fou? The answer depends on your skill. If you are a weekend golfer, a pro-level rangefinder will make you hesitant. On the other hand, a veteran golfer will not feel easy with a basic device. We have told you about our benchmarks for the review. Do you remember those? Well, they are price, performance, and features. We have used these to pick the best ten. Now we have added skill to pick the most suitable rangefinder for you. Leupold GX 4i and Bushnell Tour V4 will be the best for you. Both of these laser rangefinders are easy to use. They do not have any complex mechanism. None of these two have slope mode. So as a novice, you have to use all your measurement skills. You have to measure the yardage markers to get the green. You are not going to win the game. So a few jerks of hands will not affect your shots. None of these rangefinders have any image stabilization. So you have to be patient while measuring. The price tag of these two will not hurt your credit card. Moreover, you can save some money to buy golf clubs and bag. It will be tricky to puck the best one for you. Rest of the rangefinder have almost similar features. However, we have studied both pro and mid-level golfers responses. And come up with these names. TecTecTec VPRO 500S, Garmin Approach Z80, Leupold Gx 5i, Nikon Coolshot 80VR, and Bushnell HYBRID. 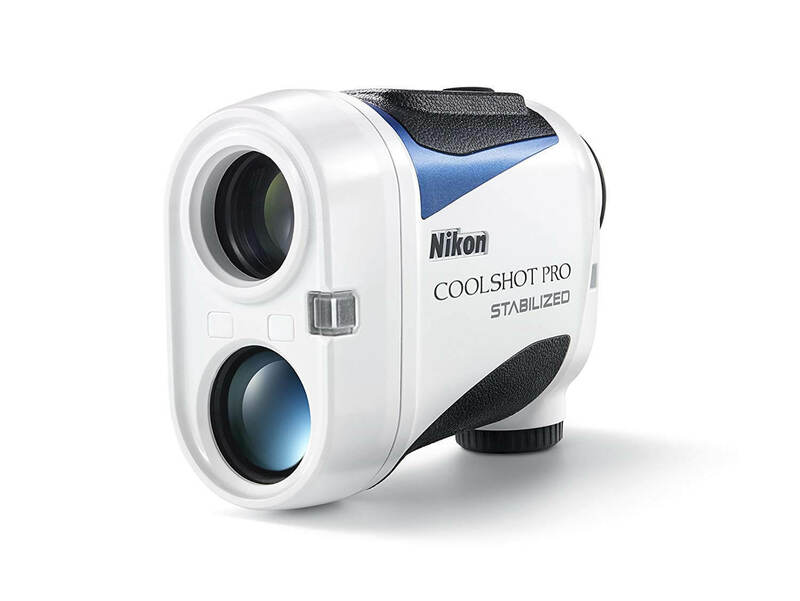 These golf rangefinders have all the necessary features for your winning shot. You can get slope adjusted distance from these. Moreover, image stabilization technology ensures a steady focus. So if your hand moves a bit you do not have to worry about missing the hole. Two of the models Garmin Approach Z80 and Bushnell HYBRID are equipped with GPS. It will give you the entire map of the golf course. Though it is a great advantage, pro-golfers do not feel comfortable with it. All of the models have target lock features. As a mid-level golfer, it will help you a lot. You will not want to make any wild guess. On the other hand, you have to do a little less calculation. The price tag is a little bit high. But as a growing golfer, you will not mind to spend it. The whole golfing world is open for you! However, you want to concentrate more on accuracy than basic trigonometry. So high-end laser rangefinder is necessary for you. Nikon Coolshot Pro Stabilized, Bushnell PRO X2, and Precision PRO NX7PRO are the best models for you. These rangefinders are the latest modifications of their brands. So they have all the updated features. You will get a stabilized image. Slope adjustment will come in the highest precision. Moreover, you can lock the target with ultimate confidence. The price tags are very high. But when you are aiming for the championships, few extra bucks should not be a headache. Now get ready for the winning shot. We hope you have packed your golf bag. Golf is a game of accuracy. You have to do a lot of calculations before every shot. A reliable rangefinder will make it easy for you. We have thoroughly studied every pros and con of a wide range of rangefinders. This study makes us narrow down our selections, Finally tailored a list of ten best golf rangefinder. These distance measuring devices are great for any golfer. However, their features make them suitable for their specific level of skills. Some models have slope mode in them. It makes them suitable to use in any terrains. But you have to check with the game committee before use. Image stabilization makes some of the devices handy. It will ensure your best shot in unbalanced situations. You can use some of the rangefinders to precisely lock on the target. It will enhance your confidence before the shot. All of these features are there to help you on the golf course. Now you have to decide which rangefinder best fits your skill. If you follow our rationals and pick accordingly, nothing can stop you from getting.